Further viewing for anyone who falls under the spell of Twin Peaks' return. Back in the early '90s there was a chewing gum we liked. On May 22nd it's set to come back in style as Twin Peaks returns to living rooms for its belated third season. If you're new to David Lynch and Mark Frost's little NorthWest town and find yourself hungry for more to chew on, here are 10 movies and TV shows that influenced or reflect the mood of Twin Peaks. Okay, so this one's self explanatory. If you haven't watched the original two seasons you'll find yourself lost like Major Briggs in the woods (a reference that of course you won't understand). Seriously, stop what you're doing and go watch before the new season premieres. If you have seen them, go watch them again to ensure you're up to speed. And don't forget to check out Lynch's feature film follow up, Fire Walk With Me. 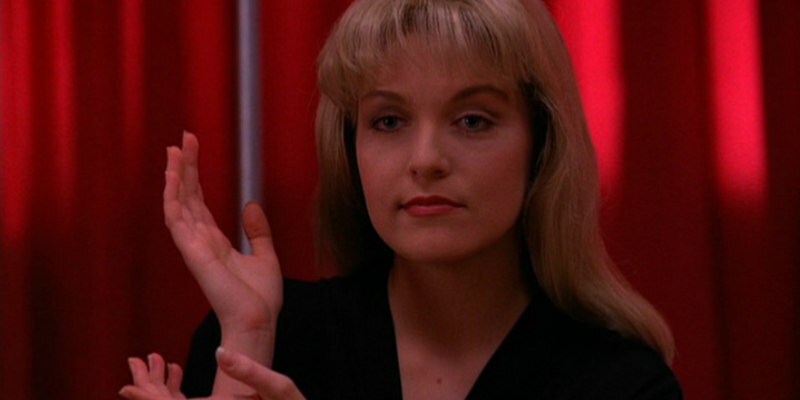 In many ways, Twin Peaks is Blue Velvet: The TV Series, as it shares many elements with Lynch's earlier masterpiece, from an aw shucks hero played by Kyle MacLachlan, to dark secrets hidden under the surface of an all-American small town, to the distinctive warblings of singer Julee Cruise on the soundtrack. Lynch's finest cinematic achievement and the movie that truly established the term 'Lynchian'. Beginning with 1972's They Only Kill Their Masters, small screen scribe Lane Slate penned the scripts for four TV movies based around the exploits of a sheriff in a quirky small town. Three of the films feature the recurring protagonist Sheriff Abel Marsh, played once by James Garner and twice by Mister TV himself, Andy Griffith, but the best of the four is the Alan Alda headlined Isn't It Shocking?, a movie with so many of the elements that would go on to be known as 'Lynchian' that were it made two decades later, it would have been accused of plagiarism. Blake Edwards' atmospheric 1962 thriller was clearly an influence on Lynch. Not only does its heroine live in a suburb named, you guessed it, Twin Peaks, but it also features a gas-inhaling villain, just like Blue Velvet's Frank Booth (Dennis Hopper). Edward's antagonist makes several sinister phone calls, a trope Lynch would later adopt in much of his work. Soured by his experience of working with shady financiers, director Herk Harvey would never direct another movie after his debut masterpiece. That didn't stop him from becoming a hugely influential figure. Carnival of Souls' twist ending inspired M Night Shyamalan's The Sixth Sense, but the biggest influence was on Lynch. Fire Walk With Me owes it a large debt, with a young blonde heroine stalked by a horrific male presence, while the mannered delivery of its amateur supporting cast would inspire Lynch's distinctive depiction of small town folk in Blue Velvet, Twin Peaks and The Straight Story. No, we're not talking about the 2012 Tim Burton travesty, but the original '60s series. Long before Lynch and Frost gave us their own supernatural soap opera, small screen horror guru Dan Curtis beamed his quirky creation into American homes on a daily basis. Beginning like a regular soap with an undercurrent of mystery, the show soon embraced its gothic side with the arrival of vampire Barnabas Collins (Jonathan Frid), followed by werewolves, zombies, parallel universes and time travel over its five year run. With over 1200 episodes, you better cancel a lot of plans if you intend binging this one. With his surrealist leanings and obsession with the colour red, Italian auteur Mario Bava was hugely influential on Lynch's aesthetic. The influence of his 1966 gothic thriller Kill, Baby, Kill can be seen in the work of several filmmakers, including Federico Fellini (Spirits of the Dead), Martin Scorsese (The Last Temptation of Christ), Dario Argento (Suspiria), Tobe Hooper (Salem's Lot) and of course Lynch, who borrowed more than a few elements of its narrative - a clue embedded in the body of a female corpse, a character chasing his doppelganger, an outsider conducting an investigation in a small community reeling from the death of a young woman - for his cult TV show. One of the first great water-cooler shows, The Fugitive had viewers hooked every week as they followed Dr Richard Kimble (David Janssen) on his quest to clear himself of the murder of his wife. In the show, a mysterious one-armed man is thought to hold the secret to the truth, and of course Twin Peaks features a spirit who inhabits the body of a one-armed shoe salesman named Gerrard, in reference to Kimble's nemesis, the determined Deputy Gerrard (Barry Morse). Twin Peaks is loaded with nods to the film noir canon, but it's Otto Preminger's 1944 thriller that receives the most explicit references. Sheryl Lee's Laura Palmer was named after the enigmatic and eponymous murder victim played by Gene Tierney, and the show also features a myna bird named Waldo, temporarily cared for at the Lydecker Veterinary Clinic in a double nod to the character of Waldo Lydecker from Preminger's film. And of course, just as with Twin Peaks, a dead girl plays a major role in the proceedings, her portrait seeming to haunt everyone involved in her murder. Billy Wilder's 1950 classic, Sunset Boulevard, was a major influence on Lynch's Blue Velvet, and in the second season of Twin Peaks its narrative dynamic is borrowed for a plotline that sees brooding biker James Hurley (James Marshall) leave the titular town to 'find himself'. On his travels he runs into a woman named Evelyn Marsh, and the ensuing drama turns into a blend of Sunset Boulevard and Wilder's other great noir, Double Indemnity, as Marsh seduces Hurley in an attempt to have the troubled young man murder her husband. The 1944 film is also referenced in Twin Peaks with an insurance man named Neff, while the hard of hearing FBI agent played by Lynch himself is named Gordon Cole, after a minor character from Sunset Boulevard.